A leopardess lieutenant observes the constable. Min watched. Always something to be learned from watching. The leopardess prowled atop the town wall, cold stone under her paws. This wall, for example. A serviceable wall, sturdy and high, but it jutted in odd ways on the sides. It had been taken from some other structure. Reusing stone from old buildings wasn't uncommon, but this rock looked nothing like the local granite. The more gossipy townsfolk whispered tales of a castle appearing in the night, the last night their sister-village stood. Perhaps the two mysteries explained each other somehow. All she could ever pry out of Toskun was how the demons came for blood and he saw they drowned in it. He could be an inscrutable old brock. Her leather armor creaked as she crouched atop the wall. Beyond the main gate, Constable Toskun stood alone in the forest. His many years could not drag down his posture, nor had they eroded his muscled form. Yes, his muzzle had gone a bit white, but that looked distinguished. Who'd listen to some cub strutting about as a constable anyway? Leaves shivered, in the opposite direction of the breeze. A soft chitter, then a flutter, then a dook. Fast as an arrow, a faerret flitted out of the trees to hover in front of him. The creature wore an acorn helmet and shimmered purple in the tree-filtered light. A royal messenger then. Distance muffled their words, reducing the faerret's voice to squeaks, Toskun's to a baritone rumble. The old badger lifted an arm so the faerret could land. His other paw rested on the pommel of his half-crystal sword. How did a rural constable come by such a weapon? The local druids knew only how to put spells in flesh, not crystal. Even in the bazaars of her homeland, such items rarely fell within the reach of mere coin, yet he treated the blade like any old piece of steel. She wasn't sure what kind of enchantment lived within it. She once saw him cut down an oak tree with it, but that might just have been Toskun. Afternoon light caught the constable, magic rolling off his body in spectral strands. They hung about him, undisturbed by breeze, an aura of spells gathered over centuries. Each filament drifted with it's own inertia, woven before her birth, tied into the great tapestry of spellwork that hung within him. 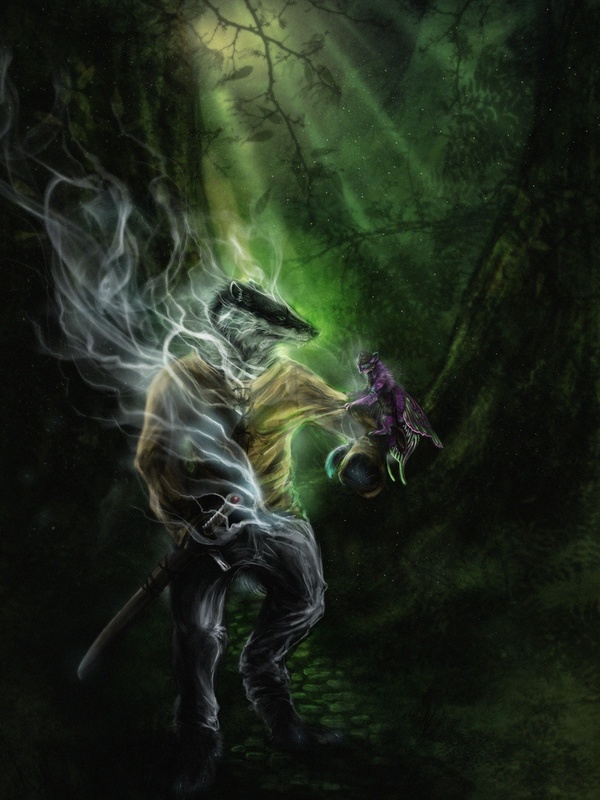 Around him, the forest loomed aglow, humming with life, like the spells, like the sword, like the badger, like the fey creature on his arm. With a final chitter, the faerret launched in a whirl of color, streaking into the woods. The constable watched, impassive. Dust swirled at his feet, leaves tumbling from the canopy before him. Min watched. She wondered what else watching might teach her today. I've had this pic sitting around for far too long! It got delayed by the Code Drop novel AND the Nordguard game.